You know what’s one of the hardest things about choosing an RDA? It’s getting clear for yourself what you exactly want out of your vaping experience. Looking for flavor? Some setups work better than others. Trying to create restrictive and flavor-packed hits with a dual-coil RDA with a wide-open airflow: it’s going to be an uphill battle. The best RDA is the one that matches perfectly with your vaping preferences. Don’t want to waste your money or read yet another superficial ‘review’ article where they sum up a bunch of useless features? Keep reading. Today, you get a list of the best RDA’s for every type of vaping-style. Important note: if you're using an unregulated (mechanical) mod to power up your RDA, read up on Ohm's Law, coil types and battery requirements. It's extremely important that you understand these concepts, otherwise, you risk blowing up your device and seriously injuring yourself. We generally recommend using a regulated mod for RDAs to avoid these risks! It should be easy to build. Well, the Wasp Nano is one of the easiest to build RDAs. And the biggest reason for that is because the screw terminals to which you attach your coil are far apart. There’s no need to fidget around, trying to fit a coil within an area that’s too small for your (fat) fingers. It’s also one of the cheapest RDAs. Think again. The Wasp Nano produces impressive clouds that taste surprisingly well. It doesn’t matter. You can still build a coil with a large surface area. The screw terminals are so far apart; you are forced to build a long coil. This length compensates for the small diameter. In fact, because you are forced to build such a long coil, the surface area of your coil will be larger than with comparable single-coil RDAs. This is also one of the reasons why the flavor is so good on the Wasp. And flavor is usually one of the main reasons why you would want to test out an RDA in the first place. It really is one of the best RDA’s to get acquainted with the world of dripping or squonking. If you’re looking for restrictive hits, the Nano isn’t your best option. It produces airy hits. This isn’t good or bad. But the air-intake holes are big, so you’re going to get quite airy hits, and there’s not much you can do to change this. Surprisingly enough, these large air-intake holes don’t affect the flavor much. With the Wasp, you can combine large clouds with great flavor, making it yet ANOTHER amazing beginner’s vape. The only reason not to get the Wasp as a first RDA is if you’re looking for restrictive hits (MTL or restrictive DTL) or you think a slight whistling sound while vaping will be too annoying. The Wasp is noisier than the average RDA. Want to vape mouth-to-lung (MTL). Some RDAs excel in 1 specific area. The Wasp is a great overall RDA, that scores good on every category, but isn’t the absolute best in any. If this sounds like you scroll through the next RDAs in the list. What type of coil you use is a highly personal matter. But the Wasp operates best in the mid-range (40-90 watts). So get a coil that operates well in this range. And the best part is you'll have enough coils to at least last half a year. For the price, it's really a no-brainer. An important tip with any coil: start with a low wattage, slowly your wattage higher in 5-watt increments. Stop when the vapor tastes well and feels good on your throat. The ‘best' wattage for your coil, is the wattage that YOU like the most. Just keep in mind that with a 0.15-ohm big fat exotic coil, you won't see much vapor production until you're over 50W. If you’re looking for unparalleled flavor, I highly recommend you to go for a single-coil RDA that runs well on low wattages. One of the best in this category is the Psyclone Entheon. Once you’ve got your setup right (more about that later), it’s easily the best flavor you’ll ever get coming out of any setup. 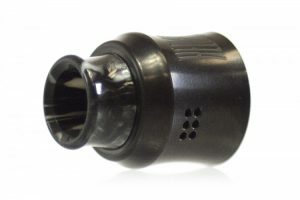 Its airflow is on the restrictive side, especially compared to the Wasp (#1) and the Goon V1.5 (#3). If you’re looking for massive clouds, pass this one. This RDA is built for restrictive DTL-hits. But its restrictive airflow is also one of the reasons why its flavor is so amazing. There’s much less air to dilute your vapor compared to the Wasp or Goon V1.5. With the stock cap, the smoothness of the airflow isn’t the best: it can be too restrictive and inconsistent. Luckily, there are simple ways to improve its airflow without sacrificing flavor. The best way I found was by using the Hadeon cap (if not available even a Wasp cap works better than the stock cap). I highly recommend using this cap as it improves the airflow and especially the flavor. Either get a Hadeon or Wasp cap for it. All this flavor does come at a price though, literally: it’s one of the most expensive RDAs in the list. But the build-quality you get is much better than some of the cheaper options. This RDA is also a GREAT option if you’re looking for a good squonk setup. Its unique squonking-well makes it very hard to leak while squonking. This is extremely convenient when you’re driving a car for example. Just squonk it up recklessly with this RDA. If flavor is your top priority, you’re into restrictive DTL-vaping or looking for an amazing squonk RDA, get the Entheon! But the Entehon operates best in the low-range (15-40 watts). So get a coil that operates well in this range. 7/8 wraps of 24G SS316 on 2.5/3mm. Is the flavor of the Entheon really the best? You might find a different RDA produces better flavor for you. But the Entheon will increase your chances in finding a flavor-packed setup. You just need to be able to support large coils and have lots of airflow. The more airflow, the bigger is the volume of vapor that can come through your RDA. When both these setups come together, you have the perfect recipe for massive clouds. But if you want to keep flavor comparable to single-coil RDAs, there are only a few options. And your best option here is the Goon V1.5. The Goon V1.5 has HUGE airflow holes and a HUGE open deck to support a dual-coil setup with 2 massive coils. Running this RDA on 100+ watts with 2 big and powerful coils will make for some impressive cloud-filled sights. Don’t get this RDA if you need to be discreet. Now, what if you don’t want to chase clouds ALL the time? Here too you’re in good hands. 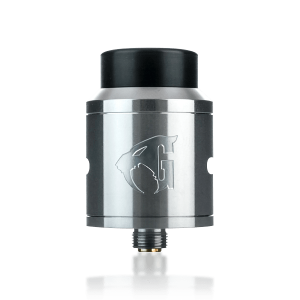 The Goon V1.5’s airflow is reducible to normal levels. And although it’s not the most straightforward setup, you could even make it work with a single-coil. Just keep in mind this isn’t what it excels at. I recommend it mostly for cloud chasing in a dual coul setup with some fat coils (more on that later). It’s a flexible RDA though, and if you would want it, you could make it work in different ways. There are no sharp edges, gaps, deformations or rough threading; everything fits perfectly. It’s also sturdy as hell and can take a serious beating. And if you’re new to dual-coil RDAs, you’ll be happy to know it's relatively easy to build on the Goon V1.5's deck. Cut off any wire that sticks out. If you want to chase clouds with good flavor, get this bad boy. But the Goon V1.5 operates best in the high-range (100+ watts). So get 2 fat coils with loads of surface area. Quad-core fused clapton coils or dual parallel coils. Ideally below .15 ohms. A pair of tri-core fused claptons either N80 (Nichrome 80) or SS316L at least 3mm in diameter. You’re going to need a mouth-to-lung (MTL) RDA. There are many reasons why a cloud chucking RDA is not a right fit for you. Maybe you need to be discreet. A Goon 1.5 can create such massive clouds that it gets kinda uncomfortable for people around you. Maybe you’re an ex-smoker which looks for a cigarette-like draw out of your vape. A proper MTL RDA will create a good throat hit that you’ll quickly associate with smoking. Just realize that the strength of your throat hit is dependent on other factors as well. For example the nicotine and PG-level in your vape juice. You won’t need to recharge as much. But this applies to any MTL RDA. What makes the Berserker so unique? For starters, it’s the best MTL RDA for squonking. Its juice well is deep. It can hold a good amount of juice without any leaking. Then there are the countless airflow options. You get multiple differently sized airflow inserts for below your coil, on top of the regular airflow holes on the sides of your deck. You can be 100% sure that you’ll find an airflow setting to your liking, ranging from super restrictive MTL to restrictive DTL. It isn’t easy to get a perfect setup immediately. If you go by the ‘test and tweak’ route, it might take you a while to find a build that works well. Don’t compress the wick towards the bottom. Let it touch the bottom lightly. The tiny juice holes at the bottom need to stay free. If you use these guidelines, you can be sure you'll have the best performing MTL RDA that's currently on the market. The Berserker RDA works best with low-wattage and thin coils. While most DTL vapers use vape juice with at least 70% VG, as an MTL vaper you will want to have 60% VG at the most. PG enhances flavor, so you will want a it more of it. A 60% VG + 40% PG is usually a good mix of vapor production and throat hit. 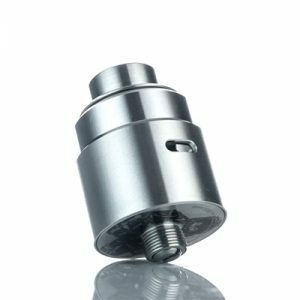 If you’re looking for a squonk RDA, any RDA in this list is suitable for that. You need an as leak-free as possible RDA. And if you’re new to squonking, it also helps if your RDA is easy to build. Well, the Recurve RDA fits both requirements. It’s almost impossible to oversquonk with the Recurve. The airholes block hard enough that they don’t let any juice pass through by squonking. Only if you purge (blow air into your RDA), you’ll risk leaking juice. When the airholes are filled with juice just take a dry hit, and the juice will run back to the coil, reducing any leaking risk. It’s also super-easy to build on the Recurve’s deck. It comes with a coiling rod which is perfect for cutting your leads at the ideal height. This rod is also great for arcing your coil if (for if you use a mesh coil for your build). On top of this, it comes close to the Entheon regarding flavor. Its single-coil design with its restrictive, but smooth airflow makes it perfect for flavor. 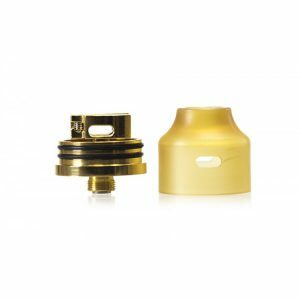 Its restrictive airflow is not restrictive enough for MTL vaping but makes it an excellent RDA for restrictive DTL vaping. Restrictive doesn’t mean that it’s airflow isn’t smooth. The airflow of the Recurve is super-smooth and quiet. Does this RDA have downsides? Yes. Because it doesn’t have a juice well, it’s not a great option for dripping. For proper dripping, you need a juice a well. Also, if you’re looking to produce massive clouds, pass the Recurve. Its clouds are good, but nowhere near the level of a Goon V1.5 for example. There currently is no better option than the Recurve. But the Recurve operates best in the mid-range (30-70 watts). So get a coil that operates well in this range. If you're using an unregulated (mechanical) mod it's extremely important that you read up on Ohm's Law, coil types and battery requirements. Generally, I highly recommend getting a regulated mod anyway. Unregulated (mechanical) mods are for the true vaping geeks who want to calculate, tinker and mod everything themselves. The average user should get a regulated mod. They're simple and effective. But even if you get a regulated mod, there are a few coiling guidelines to keep in mind. Because even though you won't risk blowing anything up with a regulated device, you do risk running a suboptimal setup that drains your battery or burns your coil faster than you would expect. First of all, know what's your target resistance AND the coil setup you want to use (meaning single, dual, triple or even quadruple). Realize that if you use a dual, triple or quadruple coil setup, that you have to divide the resistance by 2 (for a dual coil-setup), 3 (for a triple coil-setup) or 4 (for a quadruple coil-setup). This rule means that if you want to hit 0.2 ohms in a dual coil setup, you need two (2) 0.4-ohm coils. If you want to hit 0.2 ohms in a triple coil setup, you need three (3) 0.6-ohm coils, etc. The material of your coil. Vice versa, the thinner your wire the fewer wraps you have to make hit that same target resistance. A 28AWG Kanthal coil needs 2 wraps to hit a resistance of .2 ohms. So what should you choose out of these 2 options? Well, 2-wrap 28AWG is too short for a coil, because it severely limits the surface area of your coil and wick. That's why I highly recommend to always go for at least 4 wraps. Keeping these rules in mind, you can calculate exactly how many wraps your coil needs based on the gauge and material of your coil. The best tool for this type of calculation is steam-engine.org. If you didn't know already, RDA stands for ‘Rebuildable Drip Atomizer'. As you can tell by its name, these atomizers were initially designed to be used with dripping drops of vape juice onto your atomizer. 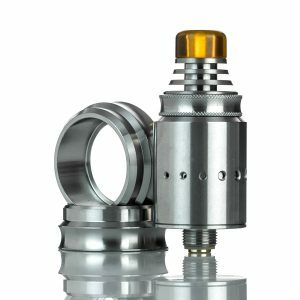 Why would anyone want to go through the tedious process of continuously dripping a few drops of vape juice in his/her atomizer? Well, if you're in it for the flavor, dripping is one of the best ways to get flavor-packed vapor. But because this process is so tedious, squonking got invented. With squonking, you insert your vape juice bottle inside your box mod, and anytime you need some vape juice in your tank, you squeeze the bottle in your ‘squonk' mod. Squonking really is the easiest way to use your RDA. You get the same flavor as dripping, without the hassle of continuously needing to drip. You can squonk with a single hand. Dripping needs various manual actions that can't be combined with other activities like driving. If you think an RDA is going to be too much of hassle, go for a regular box mod/vape tank setup. You might not get as good flavor, but it's much easier to use.